How is your business like two of the most recognized brands in the world? McDonald’s serves 68 million people in 119 countries. Starbuck’s changed the world by reinventing the way we drink coffee. You may think you have nothing in common with these instantly recognized companies, but you’d be wrong. While you may not sell burgers, fries, or coffee, you share a trait that’s just as important as the products/services you sell. You, McDonald’s, Starbuck’s, and 6300 other companies all have paper Certificates of Ownership. In the digital age we’ve moved away from hard-copy papers and legal documents, but while other documents have gone from paper to virtual, paper certificates are still around. 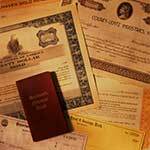 In many states, having paper ownership (like stock certificates), is no longer required by law. Even though it’s not required McDonald’s and Starbuck’s plan to keep issuing them. At Dodge Legal, we recommend you do the same.